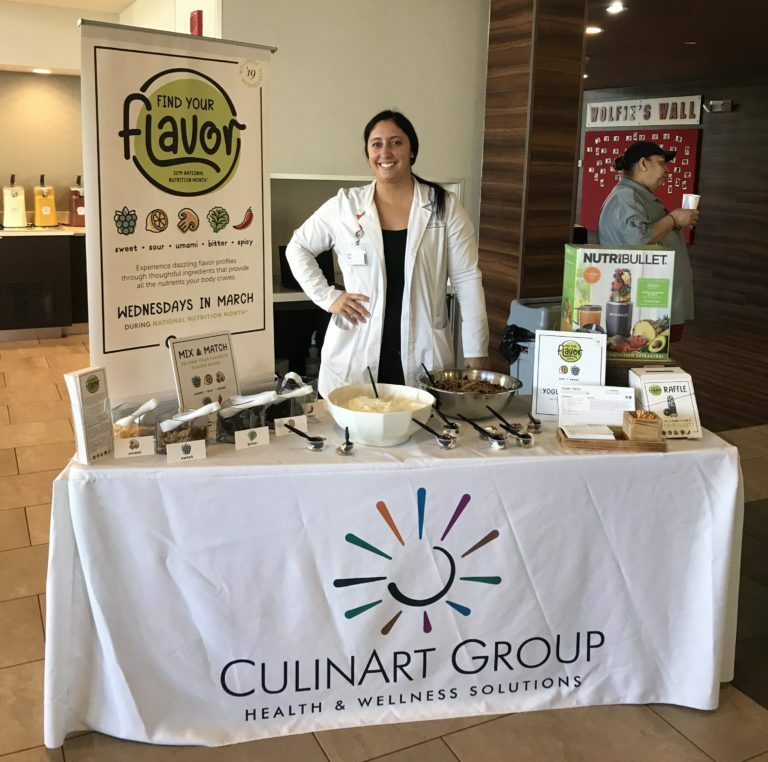 On a busy Wednesday evening during peak hours in Roth Cafe, Stony Brook’s campus registered dietitian, Laura Martorano, got to work setting up a tasting table. Next to two bowls of yogurt parfait, she carefully placed an assortment of foods from each flavor group: umami, sweet, bitter, sour and spicy. Before long, Martorano was surrounded by hungry students who wanted to taste a sample. She encouraged students to explore their own tastes by pairing flavors of foods — dark chocolate, wasabi chips, dried berries and more. As they ate, Martorano spoke about the importance of discovering different, healthy foods. Aside from organizing tasting tables, Martorano helps students find healthy dining options on campus and tackle special dietary needs. One common dietary problem university students face is tackling the infamous “freshman 15” weight gain. Although students do not typically put on 15 pounds in their first year at college, several studies suggest that roughly 61% of freshmen gain an average of 7 1/2 pounds. Like Martorano, Annemarie Ng, a nutritionist at the Student Health Center, also schedules appointments with students who seek dietary help. She said the “freshman 15” is a concern for many residential students who are adjusting to their new environment. In the midst of late night eating with friends, residential students make occasional trips to the campus dining halls where, during late hours, they serve an array of fried foods, like onion rings, mozzarella sticks and chicken wings. Ng said that students can combat the temptation to indulge in junk food by preparing meals ahead of time, reading food labels and checking out what is being served in campus dining spots. She suggested that students check out Nutrislice, an app that shows the menu at every dining location on campus. Martorano advises students to increase their intake of fruits and vegetables. In doing so, they can avoid eating other foods that disrupt their healthy diets. “It’s important to build your plate in a well-rounded way, so you have your proteins, carbs and fats and, when building your plate, you have to make sure you have half a plate of vegetables for fiber,” she said. Ng said that one of the most common myths she hears from students is that carbohydrates found in foods like potatoes or pasta are bad for you. Another thing students tend to fixate on is their body mass index (BMI), the numerical value that relates one’s weight and height, which Ng said is not the only important measurement to consider when trying to improve your health. Generally, Ng said it is important to have carbs and protein before a workout, but diets vary between exercises that target cardio or muscle building. In order to maintain different levels of exercise, students need to be aware of their calorie and carb intakes. Matt Mirabito, who is a freshman offensive lineman on Stony Brook’s football team, said he has benefitted from speaking to the team’s nutritionist, Sotiria Everett, every week during the team’s winter workouts. “She would inform us about what would be the best diet for our lifting requirements, when to be eating, when to cut down on carbohydrates and start upping on protein, so her information was set towards a football player,” Mirabito said. As campus dietitians and nutritionists, Martorano and Ng said they prioritize creating a warm atmosphere for students who seek their advice, so that students feel comfortable opening up about their dietary needs and what they want to accomplish.